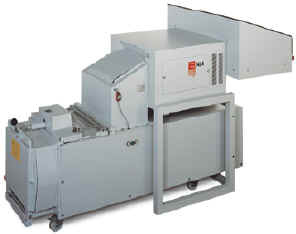 The data shredder and the baler are operated in a continuous cycle. 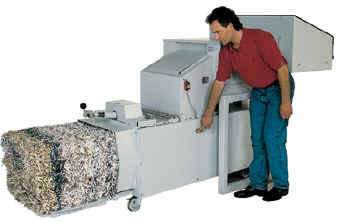 The cutting mechanism can continue to be loaded while the baler is compressing the shredded material. An audible signal indicates when the bale is completed. The compressed bale is then bound with two straps and elected from the compacting chamber by a push button control. Alternatively, the bale can also be ejected directly into an environmentally compatible plastic sack. The advantages are stable bales and dust-free handling. Shredder comes in three versions. 3.8 and 7.8mm strip cut, or a 3.8 x 40mm cross cut version.